If you had 2 hours to kill, what would you do? My go-to activity is grocery shopping. I head straight to the nearest market I can find and comb through every aisle with precision. I hadn’t done this for awhile as my schedule has been packed the last few months. But I found myself stuck near a train station with nothing to do. I spotted a HomePlus (owned by Tesco) in the distance! I was curious to see whether the displays and products were similar to the Tescos I used to frequent in the UK. 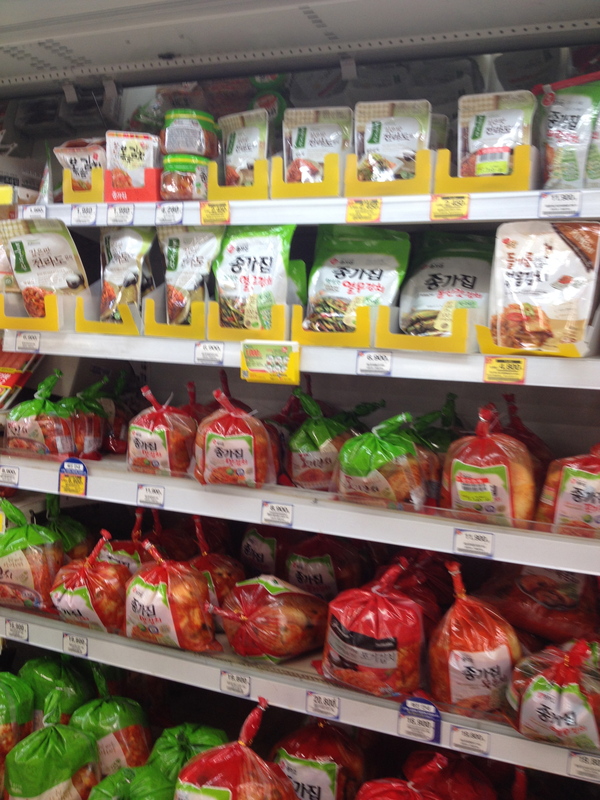 Kimchi, kimchi, and more kimchi. Tricolore rice cakes with cheese. Yes, cheese. Notice the image of a pizza on the package. What could this imply? 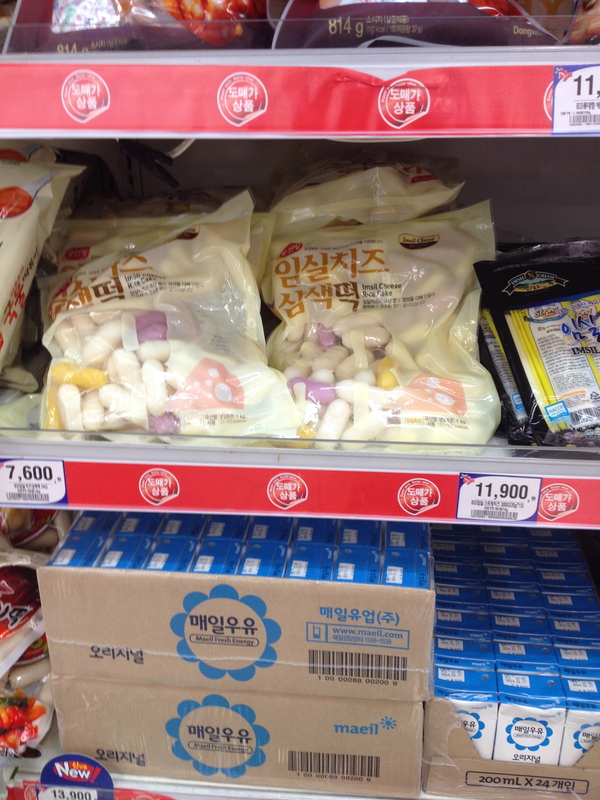 The rice cake will be as stringy as a pizza?! 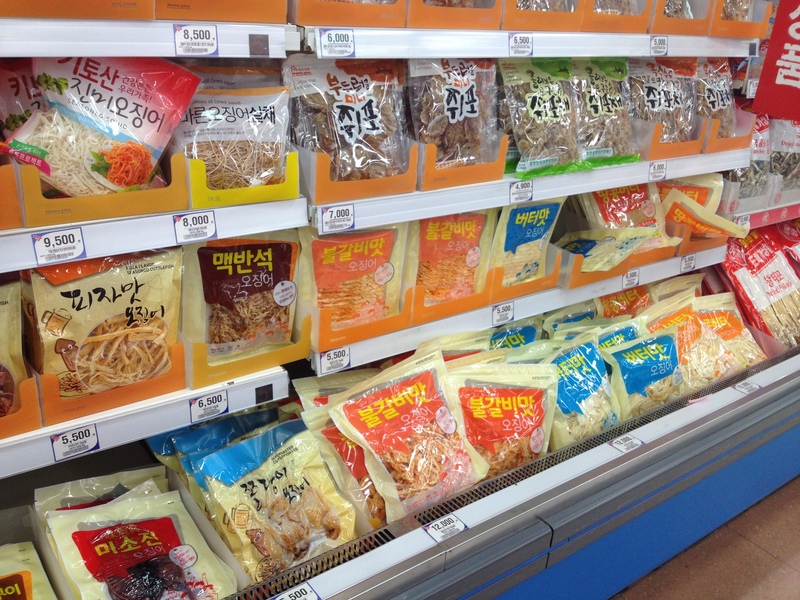 My horror mounted as I came face to face with a whole section of dried squid. 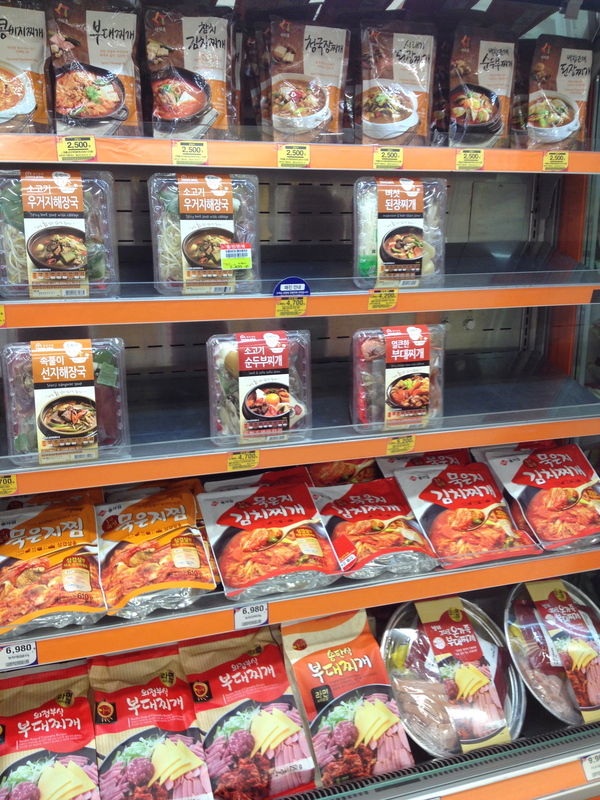 The flavors ranged from original, bulgalbi (marinated bbq short ribs ), butter, pizza, peanut butter, and beef jerky. It’s pretty common to see people eat original and butter flavor dried squid in movie theaters. I can also understand the peanut butter flavor because a popular bar snack is dried squid and peanuts. However, pizza flavor was beyond me. 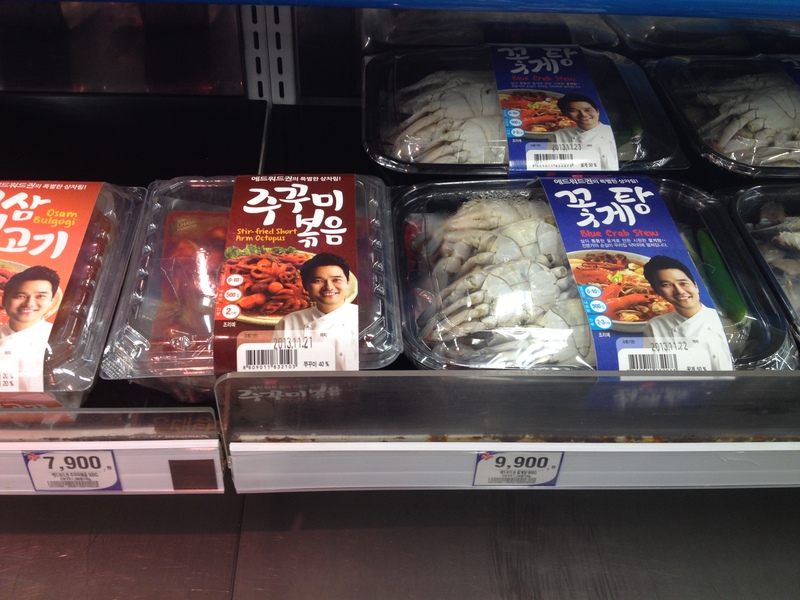 To calm down, I turned around and bumped into Edward Kwon, the first Korean celebrity chef. Thanks Chef Kwon! I now can make crab stew and spicy stir fried octopus at home and get props for cooking like a celebrity chef! Just seeing your face makes me certain that whatever I make will taste good. 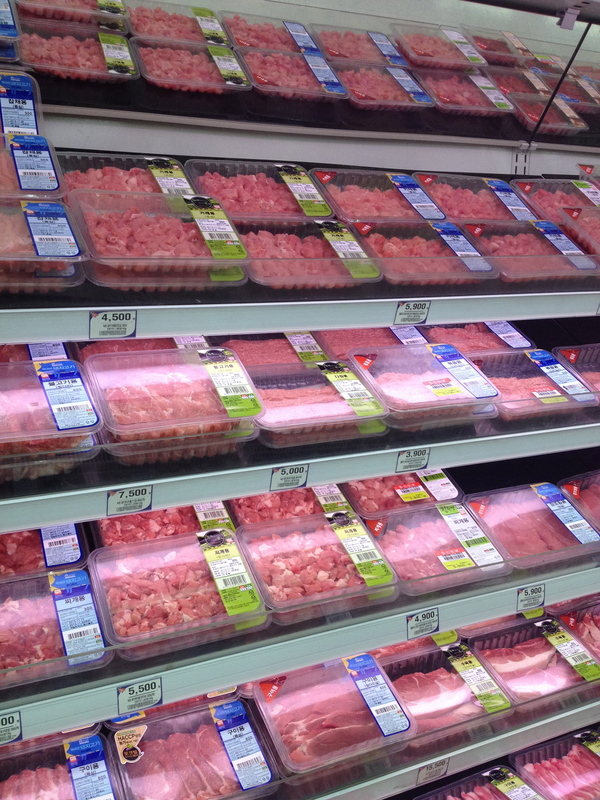 In the meat section, more friendly directions guided me. Not only did the packages tell me what to make with the cuts but how much of it I should make. 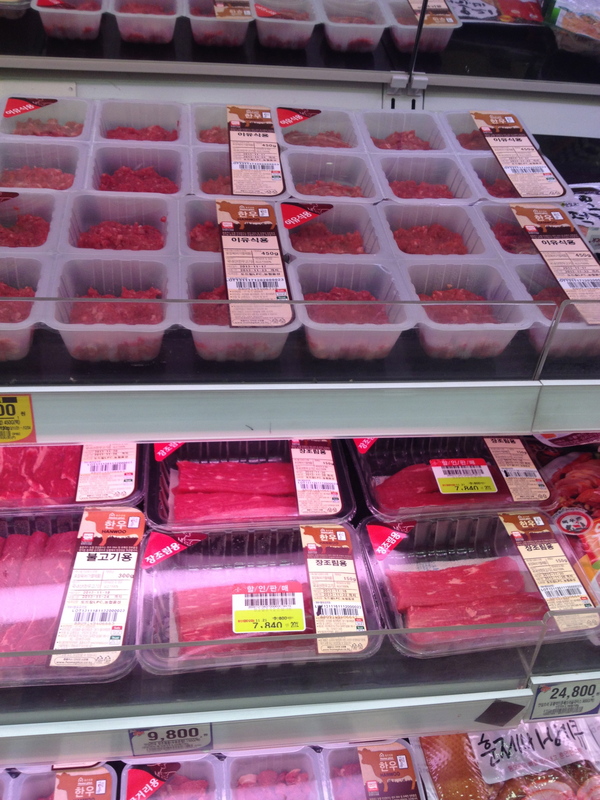 I could make baby food (top), bulgogi (marinated grilled beef-middle), or jangjorim (slow braised beef-bottom). Loads and loads of options! What great selection and choice! Wait…but what if I wanted to make something that’s not suggested here?! Oh, I guess I just have to settle for what is on offer. No need to think outside the box, right? Why make life difficult when it doesn’t need to be? The security and comfort provided by this grocery store was so intoxicating that I realized that I had been browsing for 45 mins. I needed to speed up if I wanted to cover the entire store. I still hadn’t examined the pre-prepared food and shelf stable goods! Tune in next time to hear more about the rest of my explorations!